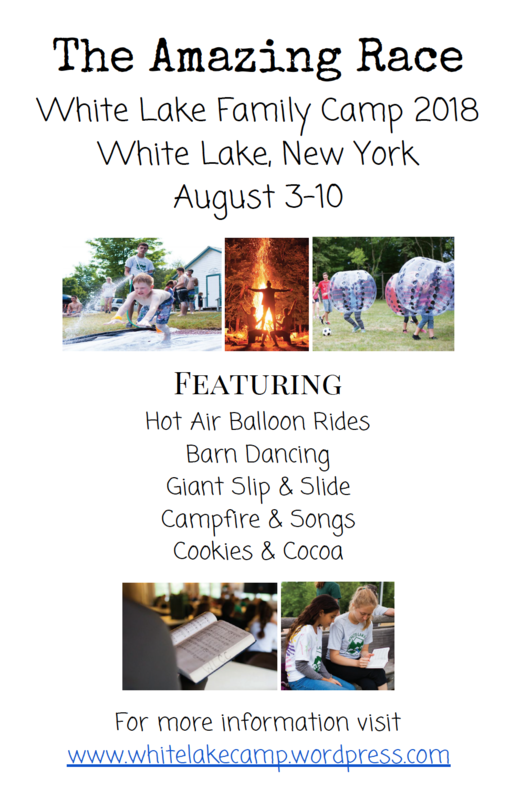 White Lake Covenanter Camp – When I'm at White Lake…. When I'm at White Lake…. White Lake Camp will open for the season with a workday on April 13. Come and join us to get the camp ready. Do you love White Lake? Has White Lake had an effect on your life? 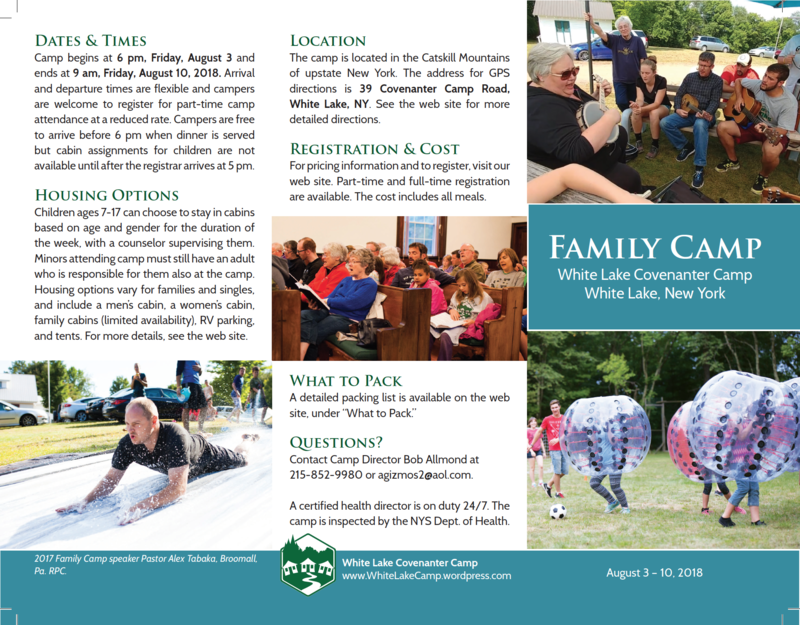 Please consider giving back to the ministry of White Lake so that we can continue to touch the lives of those in the Atlantic & St Lawrence Presbyteries as well as others in the RPCNA who attend camp. 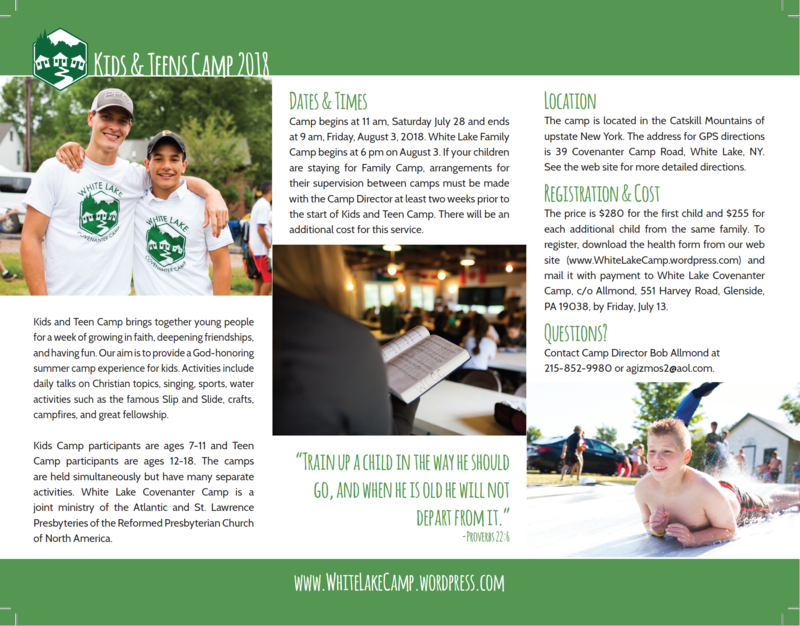 Through time, donations, and prayer you can support the ministry of White Lake! Time: Did you know that camp would not be possible without many people donating their time? It takes many hours of work to maintain the camp and keep it running smoothly. Consider giving some of your time to camp by attending work days and other events. Please join us to complete the many tasks required to get camp up and running for the season. Many hands make light work. Housing will be available for those who wish to spend the night Friday or Saturday night! 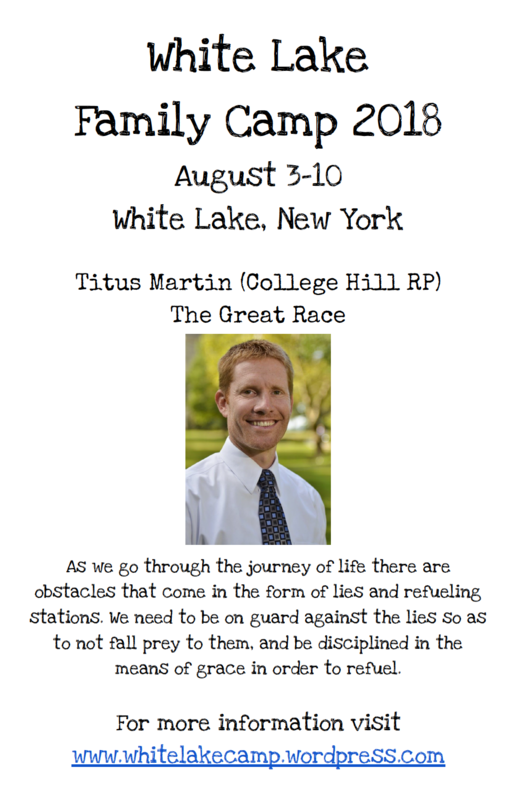 Please let Peter Robson, peter_robson@boces.monroe.edu, know if you plan to attend. Donation: Did you know that without donations from churches and individuals, White Lake would not be possible. It is only by your support that we can continue to provide Christ centered teaching, maintain the camp, and provide great experiences for our young people and families. Consider making a financial donation to camp. All donations are tax deductible. 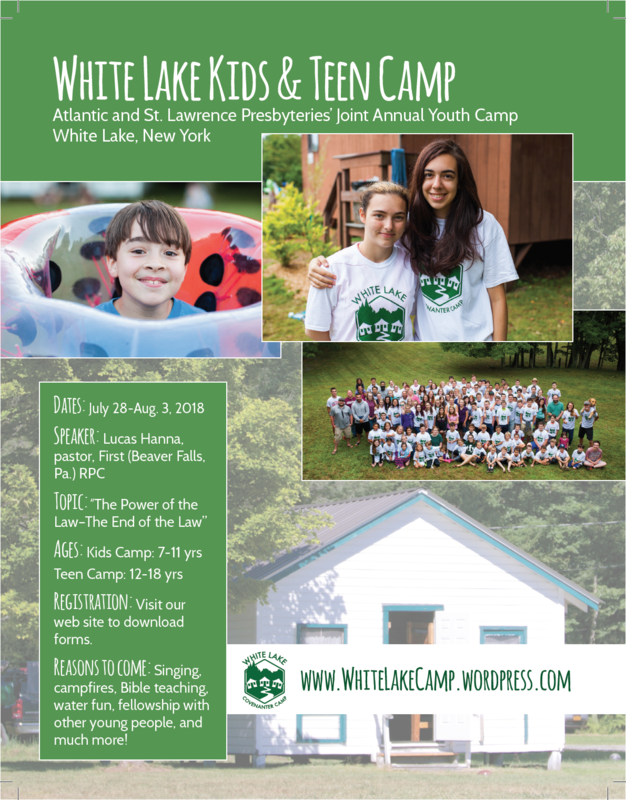 Donation checks should be made out to White Lake Camp and mailed to Sharon Robson 195 Wilkinson Road, Macedon, NY 14502. 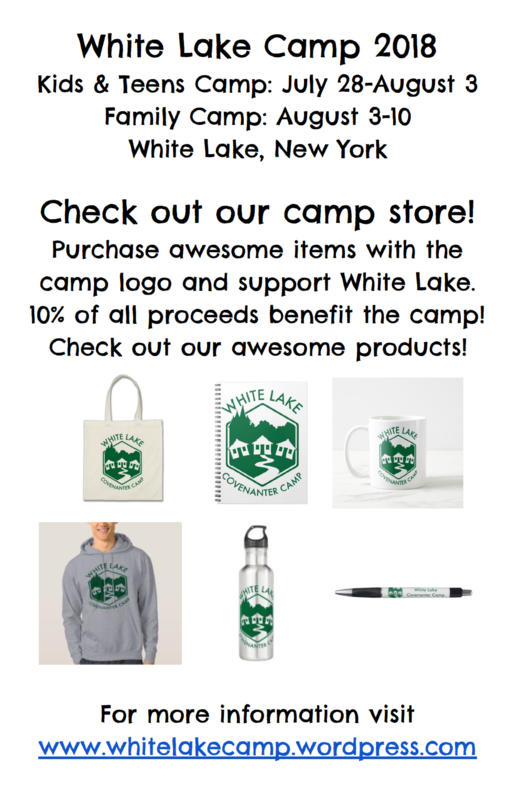 Donations can also be made through PayPal on the White Lake Camp website. We are seeking qualified counselors and staff for the 2019 camping season. The dates are: Friday, July 19th – Friday, August 2nd. Interested candidates should contact the camp director Bob Allmond at 215-852-9980 or email at agizmos2@aol.com. 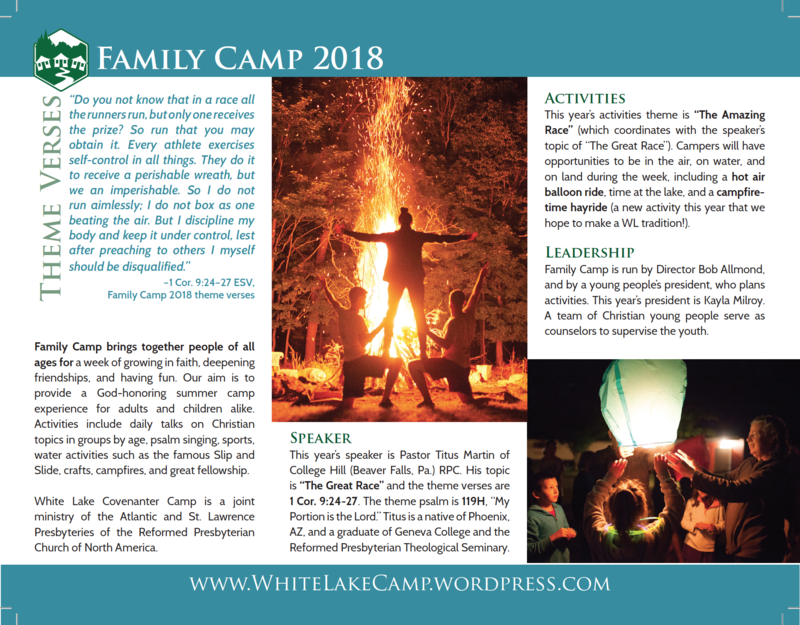 A lovely video from Steve Leach about White Lake Camp. We will be having a work day to open the camp on a Saturday April 13, and we need you! Please join us to complete the many tasks required to get camp up and running for the season. Many hands make light work. Housing will be available for those who wish to spend the night Friday or Saturday night! Please bring your own water to drink, since the chlorine levels will still be high for the camp water system. Author eklingensmithPosted on April 2, 2018 March 1, 2019 Categories Upcoming Events, Work WeekendTags OpeningDay, Work Day, Work WeekendLeave a comment on ALL HANDS ON DECK! Here is the advertising for this year! Keep a look out for it in your local congregations and on Facebook! 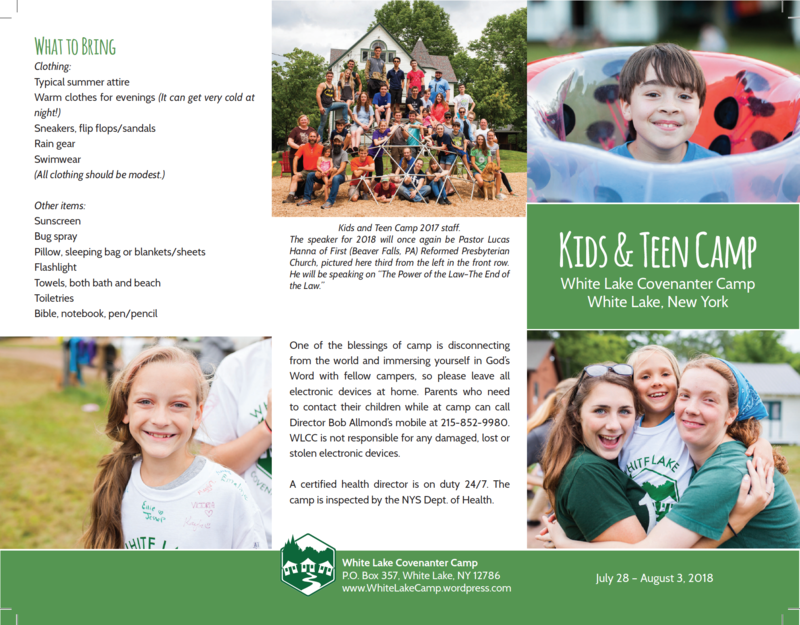 “Few people outside of our camp community know of the revitalization, stability, growth and expansion that White Lake Covenanter Camp has and is enjoying. We must spread the news of God’s goodness and grace to us.” This is a quote from our Camp Manager, Peter Robson. I believe this to be a true statement. This past summer we were blessed to see almost 100 youths and 27 volunteer counselors attend Kids and Teen Camp. 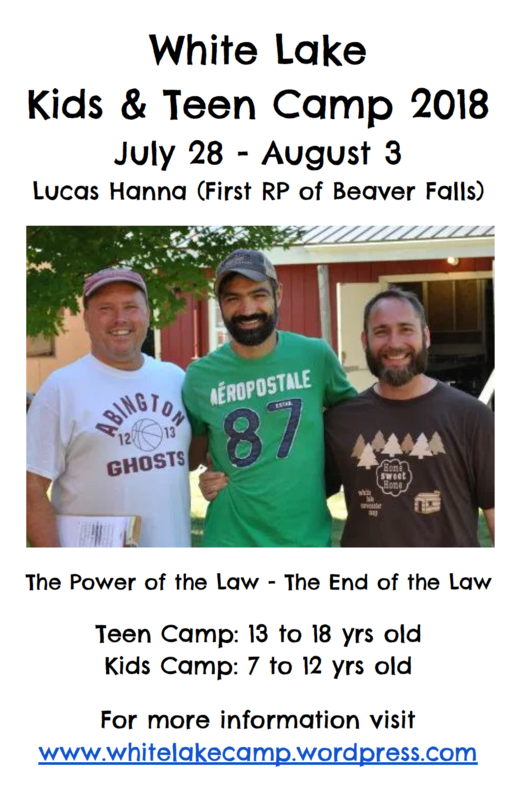 Lucas Hanna, Pastor of the First RP Church of Beaver Falls provided biblical and practical lessons for the youth while engaging them in valuable conversation. Many of the kids were involved in a variety of activities, and many for the first time participated in a dramatic presentation directed by Ms. Joanna Lowe. The kids had a blast as they participated in archery, the slip n’ slide, and games on the quad. The following week, over 150 persons attended the Family Camp. We were blessed to hear Pastor Alex Tabaka of the Broomall RP Church speak on Hebrews. We enjoyed the rich fellowship, skit night, and the largest campfire ever on our new field! 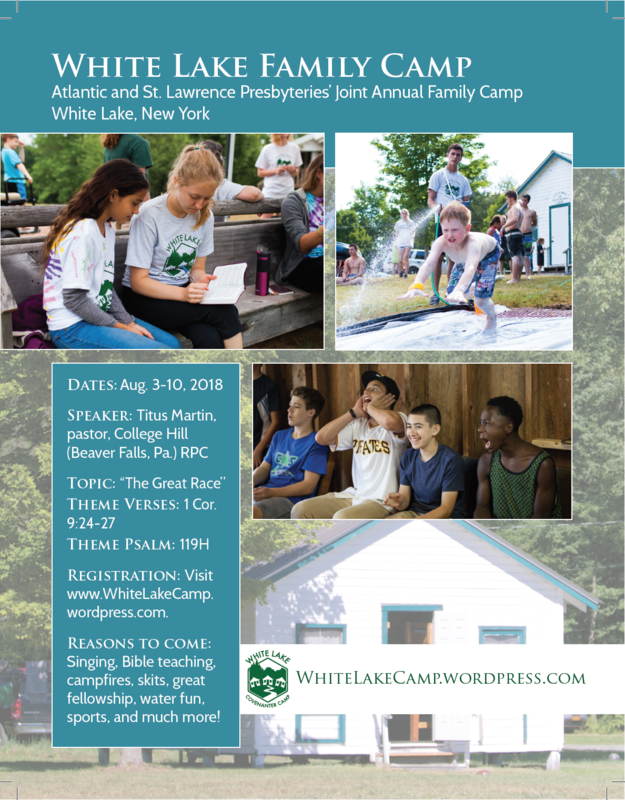 As we look forward to our next year, we hope that you are also encouraged that White Lake Covenanter Camp is continuing to serve Christ’ Kingdom under the auspices of the St. Lawrence and Atlantic Presbyteries. 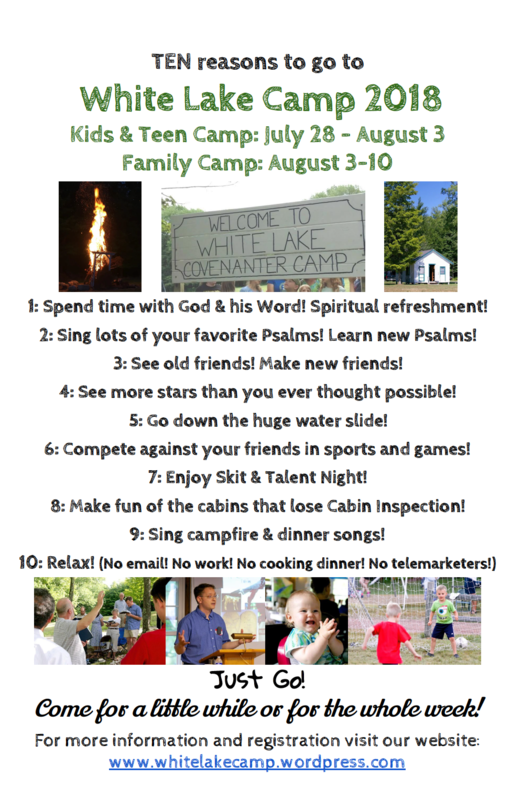 Won’t you help us develop and encourage a love for Jesus Christ in our young campers? Won’t you consider supporting us with as little as $5? Please send your contribution to Sharon Robson at 195 Wilkinson Rd, Macedon, NY. 14502. Your contribution is tax deductible.